The greatest white female rock singer of the 1960s, Janis Joplin was also a great blues singer, making her material her own with her wailing, raspy, supercharged emotional delivery. First rising to stardom as the frontwoman for San Francisco psychedelic band Big Brother & the Holding Company, she left the group in the late ’60s for a brief and uneven (though commercially successful) career as a solo artist. Although she wasn’t always supplied with the best material or most sympathetic musicians, her best recordings, with both Big Brother and on her own, are some of the most exciting performances of her era. She also did much to redefine the role of women in rock with her assertive, sexually forthright persona and raunchy, electrifying on-stage presence. 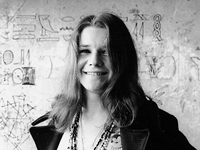 Joplin was raised in the small town of Port Arthur, TX, and much of her subsequent personal difficulties and unhappiness has been attributed to her inability to fit in with the expectations of the conservative community. She’d been singing blues and folk music since her teens, playing on occasion in the mid-’60s with future Jefferson Airplane guitarist Jorma Kaukonen. There are a few live pre-Big Brother recordings (not issued until after her death), reflecting the inspiration of early blues singers like Bessie Smith, that demonstrate she was well on her way to developing a personal style before hooking up with the band. She had already been to California before moving there permanently in 1966, when she joined a struggling early San Francisco psychedelic group, Big Brother & the Holding Company. Although their loose, occasionally sloppy brand of bluesy psychedelia had some charm, there can be no doubt that Joplin — who initially didn’t even sing lead on all of the material — was primarily responsible for lifting them out of the ranks of the ordinary. She made them a hit at the 1967 Monterey Pop Festival, where her stunning version of “Ball and Chain” (perhaps her very best performance) was captured on film. After a debut on the Mainstream label, Big Brother signed a management deal with Albert Grossman and moved on to Columbia. Their second album, Cheap Thrills, topped the charts in 1968, but Joplin left the band shortly afterward, enticed by the prospects of stardom as a solo act.